I’ve been thinking about this a lot over the weekend. And now that the count down to Friday began, the reality that this is the count down to my last chemo! I can’t say I have mixed emotions or that it’s bitter sweet, which is what you usually think about when it’s the last of something. This is the last of something that I hope I never have to ever endure again, ever. Did I mention NEVER EVER! When I was first diagnosed, had surgery, waiting for results, met with Dr. McCready, met with my Oncologist, that all seems like a lifetime ago. In someways, it really was a lifetime ago. as my life before cancer, is very different than my life after cancer. It will take a long time to find that balance again. I’ve tried really hard over these past 6 months not to have cancer overtake my life. But the reality is, that it has. Not a day goes by where I don’t think about it, how can I not. My wig and scarf or bald head is a constant reminder that there are some things I have no control over. My scars, my “badges” of cancer will always be there. I remember going for my first chemo in April, scared, really not knowing what to expect. I was prepared with animal crackers, ginger ale, advil, tylenol, Poweraide, and every other thing that people told me I should have. They are all still sitting on my night table! I’ve been lucky, I didn’t get many of the side affects from the chemo that I was sure I would get, Don’t get me wrong, what I did get wasn’t fun, but I know it could have been worse, I’m grateful that other than the feeling of being hit by a mack truck and having the life sucked out of me, I was otherwise ok! I’ve learned a lot about myself, and realized that I am a lot stronger than I ever gave myself credit for. I learned a lot about the people around me, and felt more love from others than I could ever have imagined I would. I really am so grateful to so many friends and family. I have met the most incredible people during the past few months, people I never would have had it not been in for cancer. I’ve been blessed by such generosity by so many. So there has been some good through all this. I got to throw the baseball out at the Blue Jays game, I was asked to speak at the PMCF news conference at the announcement for Dr. Tak Mak & Dr. Dennis Slamon’s new drug going to clinical trial. I met Dr. Slamon, the inventor on Herceptin. I like to think I was able to get other woman to go get their Mammograms by sharing my story. All these opportunities brought to me because of cancer. I’ve learned even when I’m having a really crappy day, that the sun always rises the next day. 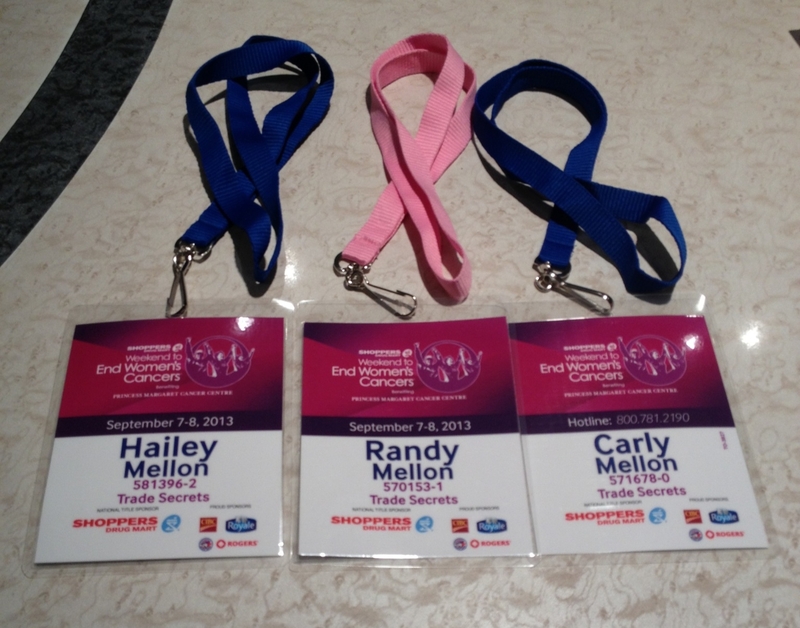 Today, my credentials for Weekend to End Woman’s Cancers arrived today, along with my daughters. My lanyard this year for the first time in the 11 years I’ve been walking, is pink. Taking it out of the envelope was bitter sweet. I earned this pink one, yet, it’s not a “stripe” I had wanted to earn. But I will wear it proudly, as I AM A SURVIVOR, and I will join a unique and incredible group of woman that exemplify such beauty and courage. Something that I truly didn’t completely understand how special these woman were until I became part of this incredible group. I only hope that I can inspire and give support to someone in the same situation, and pay it forward, and be there for someone just as so many were there for me. I know I still have a long road ahead of me. After Friday, I will have 2 really crappy weeks, but those will be the last of the really crappy weeks, and slowly I will start to feel better. I still have radiation to go through, and I still have a year of Herceptin, In October, I’m going to be tested for the BRAC gene, And of course I will have more CT scans, and monitoring for many years. But for right now, it’s all about Friday. One last chemo. Yay!! Hard to believe it, It seemed like it was so long ago that I started, I remember thinking, would this ever end. And here we are. I couldn’t have done it without all the amazing support and love that surrounded me and continues to surround me everyday. Bring it on Friday…let’s get this done, and move on…..
Randy your post says it all – family, friends and love are what get you through this tough journey! You are a true survivor and a role model for others that may have to experience this journey themselves…you make us PROUD! Looking forward to meeting you to Michele! How come you haven’t already been tested for the brca mutations? When I first met my surgeon, that was one of the first things offered so I did it. I told them my surgery decision depending on the results so they rushed the test. It only took 2 weeks rather than 2 months, or whatever the crazy wait time is. initially my surgeon was positive that I had a brca mutation because of my young age and he wanted to do a double mastectomy with immediate reconstruction right away. I was like, whoa there buddy, I’m not going to do something so drastic without knowing my brca mutation status. I’m glad I waited because I don’t have mutations on either gene so I opted for a lumpectomy. Whether that was the right decision or not (my sis thinks I should have gone with a mastectomy), it was the right decision for me. The offer was there to do it before, but I chose to wait based on my biopsy, and the fact that my tumor was very small. Once I had the lumpectomy, my treatment plan was as aggressive as if I had a mastectomy. Both my surgeon and oncologist said at this point having the gene would not change my treatment plan at all. so being tested could wait. So that’s what I chose to do. If I do have the gene, then of course I would have more decisions to make, but already having had cancer and gone through such aggressive treatment, if I was positive, I would be monitored very closely for breast cancer coming back. If I was positive, I would have a complete hysterectomy. I’m 52, already in menopause, I have 2 kids….take it out if I had to. But, we’ll wait and see. Right now, I’m happy with my decisions. I read your posts everyday as soon as they come. I don’t respond because the responses would be pages long if I really wanted to tell you everything I think, feel, hope etc. But, I want to tell you how often I think of you and send you inspiration and hope. How I talk about you to others, and so on and so on. I wish you could just look into my mind and read it all. There is too much detail to go into, so for now lets hope this is the last chemo EVER! Keep fighting and keep surprising and inspiring yourself! You have been so gracious throughout this painful journey. You have certainly paved the way for others with all your honest and genuine sharing of your experience. It will be such an honour to walk with you in two weeks. I will send allthe positive virtual hugs I can between now and friday that this last one will be less mack truck and more just need a nap. Keep well friend. I think you are inspiring and amazing. Proud to be counting you as one of my friends. All the best this Friday.. I will be thinking of you and sending positive vibes and thoughts.. Ring the bell loud and proud!! You are such an inspiration! Randy, I am sending a big hug your way. By sharing your true thoughts, you are changing lives that you do not even know about. Good luck on Friday! All the best to you on Friday. I have been reading your posts and I too, think of you often. You have handled your journey so graciously and passing on valuable information to others. Good luck on Friday and I wish you health and happiness. Good for you, Randy, for continuing to count all your blessings, staying positive and always looking to the bright side however challenging that may be! You are so inspirational! Such strength and courage to be able to post what you have been going through in your fight against cancer!! Thinking of you and sending you out positive vibes for a speedy and cancerous free future!! !